Daniel Meeboer and Neal Willard founded Inkari in 2014. After years of travelling through Central & South America, setting up non-profit projects and organizations, they began to soak up more and more of the Peruvian culture. They met people of diverse cultural backgrounds, from all different social classes. Amongst these people, they met alpaca wool farmers and producers. 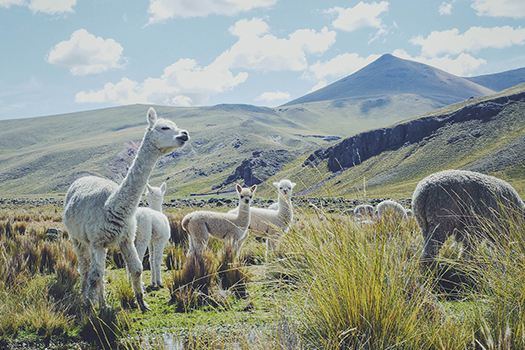 Having felt alpaca wool first hand and seen the way in which the alpacas live on large free-range farms in the beautiful Andes, they felt determined to bring that luxury back with them to Europe. They met people of diverse cultural backgrounds, from all different social classes. Amongst these people, they met alpaca wool farmers and producers. Having felt alpaca wool first hand and seen the way in which the alpacas live on large free-range farms in the beautiful Andes, they felt determined to bring that luxury back with them to Europe. They began by travelling through Peru in order to research the best suppliers and producers. They wanted to create the perfect combination between authenticty and fashion, luxury and tradition. This combination of characteristics is what has shaped the brand today. Inkari creates sustainable, high quality products made from alpaca wool. The products range from slippers to scarves, from throws to fluffy toys, to rugs and pillows. All the products are made in Peru from the highest quality wool and by the most experienced producers from Peru. We strongly believe in equality and transparency while doing business. All our partners in Peru that are helping to create our products for you are equals, they are respected and are given both fair wages and fair treatment. Fair trade, trust and maintaining high quality standards are our main priorities in the relationship with our partners. Additionally, all products are entirely animal friendly, alpacas never suffer in the process. The alpacas from which the wool is taken are sheared once a year. This wool is, in almost all cases, the number one source of income for Peruvian farmers. Therefore, the alpacas are treated respectfully and are never harmed. There's a beautiful symbiotic relationship between the farmers and the animals. We strive for 100% social business and to have positive economical impact on everyone in our supply-chain. By paying honest wages and prices we believe we'll create a positive economic cycle where everybody is gaining and is motivated to deliver the best work they can! This protects our high quality standard and relationships for the long term, so we can keep making our customers happy with beautiful, soft and warm products from alpaca wool! So why is alpaca wool so special? Living thousands of meters above sea level in the Andes, alpacas have to deal with drastic temperatures, from freezing cold to searing heat. Their wool has evolved to deal with these huge temperature differences. Their fibre is hollow and smooth, meaning that during the hot summer days, it becomes breathable and keeps them cool. Throughout the cold winter nights, the fibre insulates the alpacas skin and keeps it comfortable and warm. This unique combination makes alpaca products ideal for any weather situation, always keeping you as comfortable as possible. In addition to its comfort and softness, alpaca wool does not contain any lanolin, making it hypoallergenic. Over 90% of people with allergies to sheep wool do not encounter any issues with alpaca wool. Over the last two decades, alpacas have gained an increased amount of publicity, and not just for their cuteness! Farmers around the world have started to notice the advantages of using alpaca wool over other fibers. Alpaca wool is amongst the finest in the world, favorable over cashmere. Since we strongly believe in the quality of our products, our brand provides guarantee that the product has same characteristics as advertised. Is it clear why alpacawol is such a beautiful and responsible material? Have you become curious about what type of products we make from alpaca wool? Check out our collection here; Varying from delicious scarves to the coolest handmade alpaca toys! Cashmere vs Alpaca: What is the responsible choice?